Below is County Map of Amador in California showing the boundaries, roads, highways, towns and much more. Founded in 1854, the County of Amador is located in the Gold Country region, also known as Mother Lode, in the Sierra Nevada foothills in Northern California. The county seat is Jackson and the largest city is Ione. The county is about 45 miles southeast of the state capital, Sacramento. 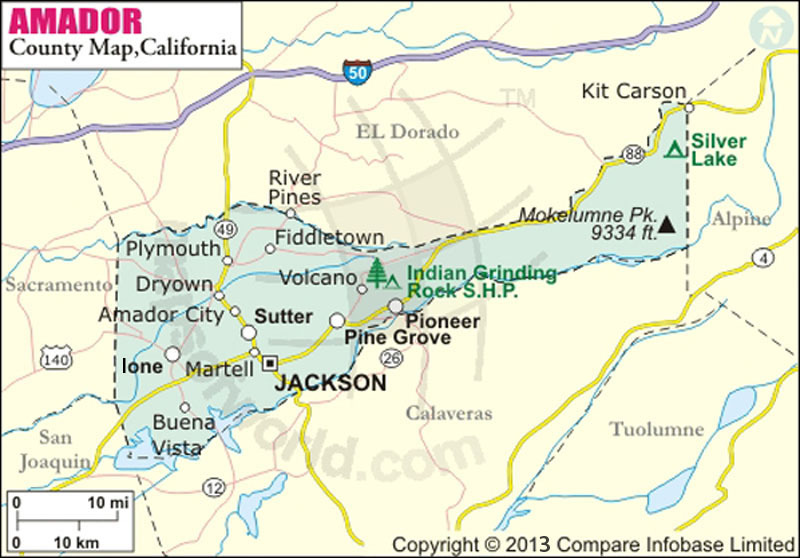 Covering a total area of 606 square miles, it is the second smallest county in California. Although the county bills itself as "The Heart of the Mother Lode," today it has a substantial viticultural industry as well. Elevations in Amador County from 76 meters in the west to more than 2,700 m in the eastern portion of the county. With an elevation of 2,869 meters, Thunder Mountain in the Eldorado National Forest is the highest point in Amador County. Kirkwood Mountain Resort, in the far northeastern corner of the state, is one of the largest resorts in Lake Tahoe region. The county is dotted with century-old gold-mining sites and vineyards with wine-tasting activities. Campgrounds areas with gold-panning activities are popular among visitors. The city of Jackson is replete with beautiful historical landmarks such as Jackson Gate and Jackson Rancheria. A celebration of local history and culture, Amador County Fair is held annually in Plymouth. The Amador Vintage Market, Mace Meadow Golf Course, Indian Grinding Rock State Historic Park, and Black Chasm Cavern are major attractions in Amador County. State Route 88 is the major east-west corridor in the county. SR 16 and SR 49 are secondary highways traversing the county. Nearest commercial airport is located in Sacramento.